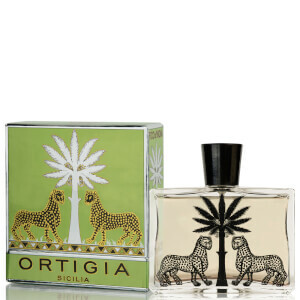 Ortigia Fico d'India Eau de Parfum (100ml) is unashamedly exotic in its fragrance and presentation. A luxurious combination of Fico d'India cactus oils and natural extracts of the amazing orange wild flowers of Sicily - every drop vividly evokes that most beguiling and sensuous isle. Created by Lorenzo Villoresi from completely natural perfume and ingredients, and using only organic colours, the opulent Fico d'India fragrance of powdery fig and cedar is perfectly matched to the luxury of the Ortigia gift box and flask, with its prestigious Ortigia leopard and palm tree design.